President Donald Trump did the unthinkable when he received calls about Santa Claus on Christmas Eve: he asked a boy if Santa Claus was real. Add Donald Trump as an interest to keep up to date with the latest Donald Trump news, video and ABC News analysis. In front of a roaring chimney in the White House State House, the president asked a seven-year-old Coleman if he was "still a believer" and possibly shook the boy's faith in Saint Nick forever. "Hello, is this Coleman, Merry Christmas, how are you?" Trump asked. "Do you still believe in Santa Claus, because at 7 it's a marginal question, right?" the president added with a giggle. 81225_hpMain_4x3_992.jpg" border = "0" width = "640" height = "480 "alt =" PHOTO: President Donald Trump speaks on the phone and shares updates to follow Santa Claus' moves by Santa North American Aerospace Defense Command (NORAD) on Christmas Eve, Monday, December 24, 2018. 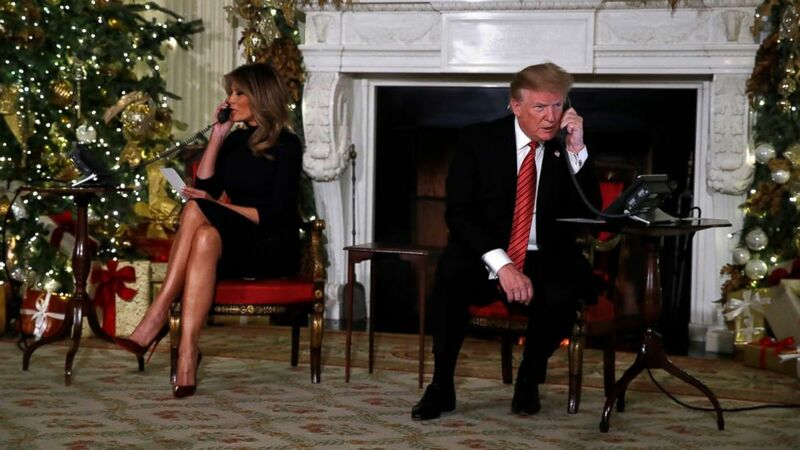 President  Donald Trump talks on the phone to provide updates to track Santas movements of the North American Aerospace Defense Command (NORAD) on Christmas Eve, Monday, December 24, 2018, from children around the world who are the North American Aerospace Command (NORAD) who has been following the Christmas Eve of Christmas Eve around the world for 63 years. Trump may have been in a bleak mood because of the ongoing government deadlock and recent stock market rally, but he seemed happy in later calls. They laughed at him, questioned children about their hometowns, and thanked a general for his service. President Donald Trump makes a statement He will close the possible closure of the government before signing a reform bill on 21 June 2018 at the White House Oval Office in Washington DC. "What Santa's bringing for Christmas? Who's with you?" He asked another young caller. "Nice Christmas and I'll talk to you again, okay? " First Lady Melania Trump tweeted pictures of the couple who had previously received calls. Trump showed a happy smile in a dark suit and a red tie. She called the annual event one of her favorite traditions in the White House. "Helping children across the country #Santa becomes one of my favorite traditions," she tweeted. "@Potus and I worked with @NORADSanta – #ChristmasEve"
NORAD traces Santa's sleigh since 1955 from the North Pole. This tradition began when a department store accidentally placed the phone number of a NORAD officer in a Christmas ad. Most government offices were closed due to the closure, but NORAD said it would definitely continue its longstanding tradition. "NORAD will continue its 63-year tradition of NORAD Tracks Santa on December 24 in the event of a government deadlock," NORAD tweeted last week. "Military personnel directing NORAD Tracks Santa are supported by approximately 1,500 volunteers who provide the program each year."